There was a short lived coal mine at Wheatcroft owned by the Moorwood Moor Colliery. They also owned a brickworks (and Crich Manor House/Pot House). The estate came up for auction and was advertised in the Derby Mercury dated 17 February 1875. 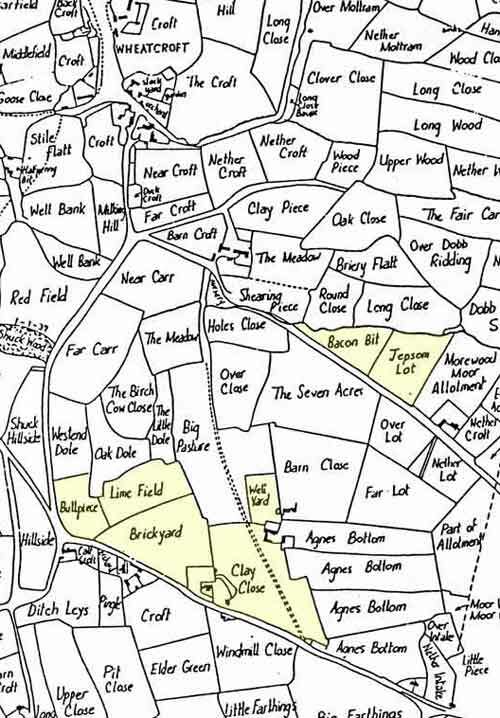 The field name map below shows the position sites being auction off: Bacon Bit and Jepson Lot (for the colliery); Bull Piece, Lime Field, Brickyard Close, Clay Close and Well Yard for the Manor House. Agnes Bottom, shown on the map was also up for auction.